Beryl Lipton filed this request with the Poway Fire Department of Poway, CA. 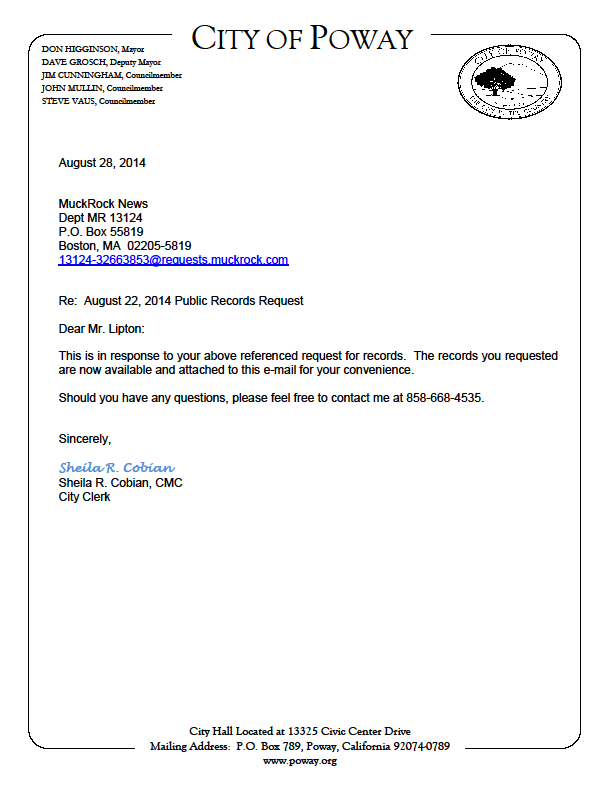 This is confirmation that we have received your Public Records Act request dated August 22, 2014. In accordance with the California Public Records Act we have 10 days in which to respond to your request. We will notify you when the records requested are available for review and/or purchase. The Public Records Act allows the City to charge the direct costs of duplication of public records with a copy charge of $.50 for the first page and $.10 for each page after that for standard letter/legal sheets of paper. Thank you so much for your message. I'll be happy to hear from you again.